A selection of Darwin's extraordinary adventures during the voyage of the Beagle. This is a nice little insight into Darwin’s journals and his explorations of nature both off and on-board the Beagle, although it struggled to capture my attention. There are many detailed accounts of his encounters with animals, insects, landscapes, and even the natives, on whom his remarks are spectacularly outdated and frankly racist. 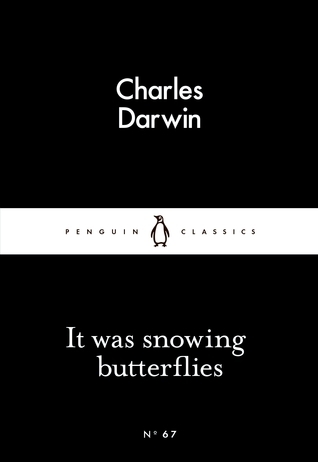 The beauty of all of this, though (apart from the old racist part), is seeing the world through the eyes of someone who doesn’t have the benefits we do now – namely Google – and the titular line “it was snowing butterflies” could only have come from someone with this fresh view of the world. It was written in a simplistic style, which worked well for the accounts, however the lengthy notes on the behaviours of both animals and plants was dull to me. Perhaps you, an intellectual, will fare better.